We also started doing the daily quest for Void Shards and managed to get the first 2 pieces and by the end of the week we’ll have the third. 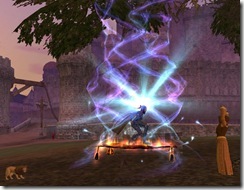 I think our next goal is to get Lore’s mage caught up and I wouldn’t mind getting my ranger leveled so we have a scout class to give us some versatility. I’d also like to spend some time mentoring guildies to see if we can put together a group and maybe start in on some of the TSO instances. I also want to get the crafting epic done with Sisca and Acsis is about halfway through the harvesting cloak so he’d like to finish that off as well. I actually beat Acsis to 80, albeit not by more than a few minutes! Lore was born Feb 20, 2006 and had a played time of 35d 8h. I do beat you on the whole tradeskillers to 80 bit, with three of them there, but of course Loredena is not one of them, so I don’t have an 80/80 yet. I totally know what you mean about taking a while. My main still is not 80. He’s just short of it right now but I haven’t really had the time to get him there. Been playing him since the night of launch too…. @Steve – towards the end it seemed rather a grind I admit. Lore was actually a reroll a year when we resumed playing in 2006 — my original avatar, a conjurer rolled on the night of launch, is currently 67 and I’m having trouble pushing myself through Kunark with her. I always find it funny how people just assume that everyone has *at least* one level 80 if they’ve played for more than, say, 6 months when I know so many people about whom that is so not true!